Molly Moore A Blog for my Dog: Aren't You Done Yet? 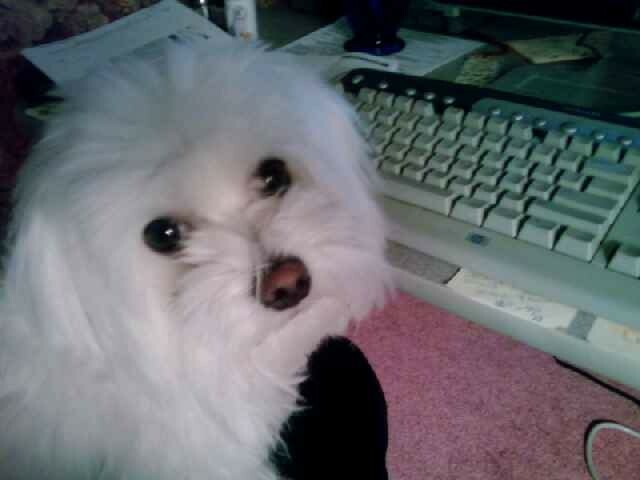 This blog is dedicated to my beautiful Maltese "Happy". This creature has brought so much joy, peace and contentment to my life. Thank you Lord for sending him to me when I was truly at a low point in my life. This puppy is so wonderful. He gives me a great reason to get up in the morning!! Aside from that he is a wonderful companion who "nudges" me to keep going. What a blessing it is to have him as a companion in the car. I have never had such a wonderful companion in the car. I have had demanding back seat drivers, annoying passengers, or just lumps on a log next to me. Happy however is so excited to be getting into the car! He jumps into my lap, wraps his arms around my left arm so that he can stand and feel the breeze against his face as he looks out the window. This may not seem like a big deal to some people, but as I mentioned before I have never had a dog! So to me it is an amazing experience. I was born in Cairo, Egypt.